I took the shot of the full moon last night wala lang. 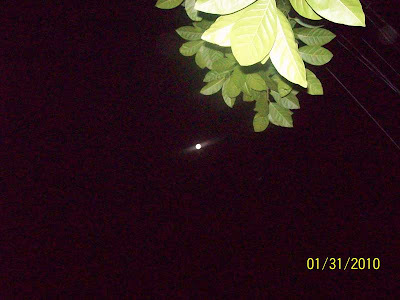 I was using an ordinary digital camera so I wasn’t able to capture the beauty of the full moon, but I capture something else. Kind of creepy actually. Haven’t seen a ghost in my entire life, but orbs through the camera lenses, yes. But are they (orbs) for real? I took these pictures at 1 a.m. today. No orbs yet. 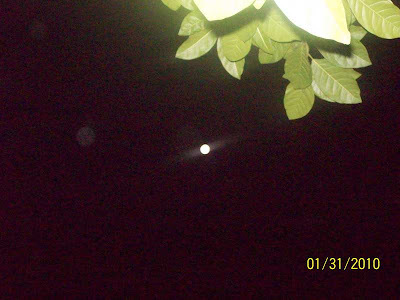 See the white spot on the left side of the moon? Yay, its getting closer. See the big circle on the left corner of the picture? Orbs nga kaya? Bakit parang lumapit? Waah! 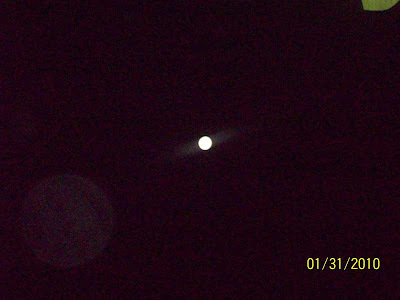 This entry was posted in Uncategorized and tagged full moon, orbs on January 31, 2010 by Yami.